The Kohl's Black Friday sale will go LIVE online tonight at Midnight! As of right now we know that you can save 15% off of your purchase with the coupon code: CHEERFUL and that everyone will earn $15 in Kohl's Cash with their $50 purchase. You can preview the ad HERE. 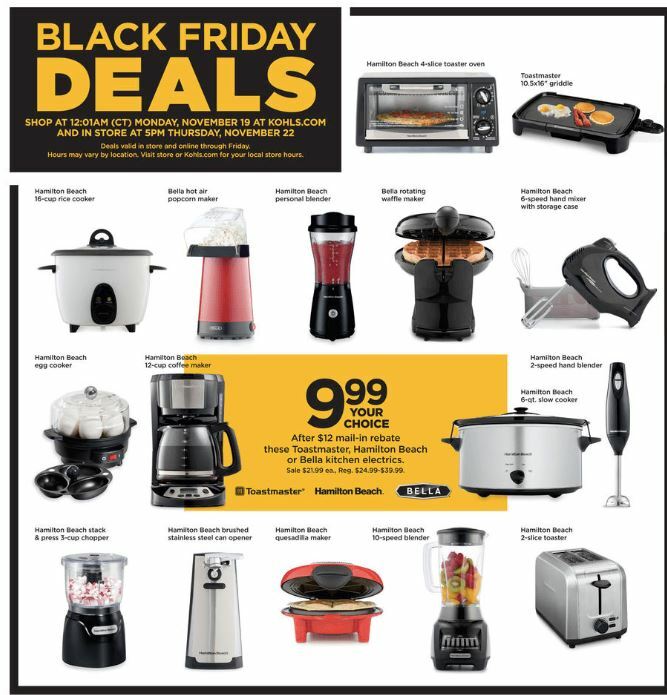 One of the most popular deals yearly is the Toastmaster, Hamilton Beach and Bella Small Appliances on sale for $9.99 after Mail in Rebate. PLUS with the coupon code your price drops to $8.50 each. OR save even more by purchasing 3 and using the code: CHEERFUL to drop the price to $56.08 plus earn $15 in Kohl's Cash bringing your total down to just $1.69 each after the $12 Visa Rebate is applied. Keep in mind these sell out FAST so you'll want to cash in on this deal early.